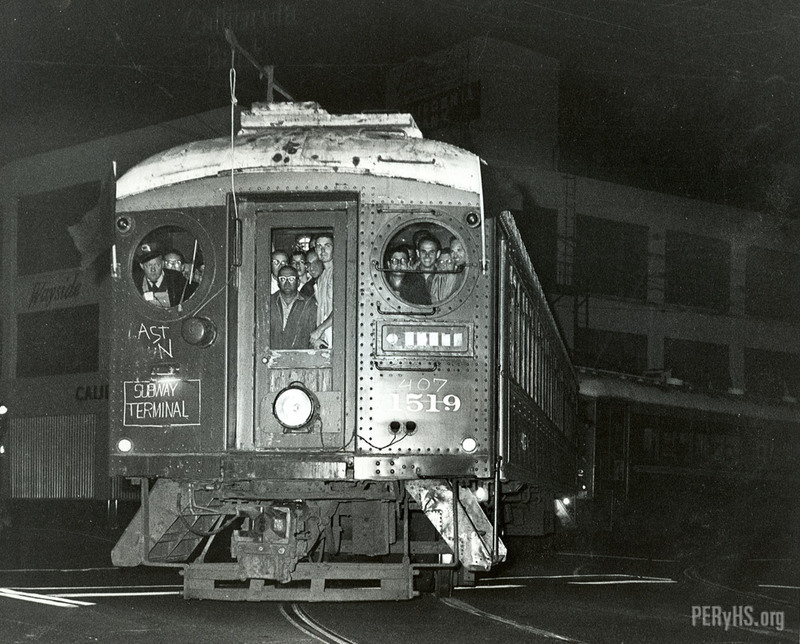 Railfans crowd the viewing portholes on Metropolitan Transit Authority (ex-Pacific Electric) no. 1519 blimp on the last run from Long Beach to the Subway Terminal Building in downtown Los Angeles. Railfans Alan Weeks, Chuck Agler, and Jack Finn are visible in the porthole on the right (the left porthole on the car itself). The date is March 30, 1961. I was in the car. In the right window you can see Alan Weeks, Chuck Agler, and Jack Finn. Certainly NOT, long gone before the abandonment of the Long Beach line to the Subway Terminal. What Ken is meaning to say, is that regardless of the chalked destination sign on the 1519, there were no tracks between 6th and Main and the Subway terminal building in 1961. This picture had to be taken between the PE Building and the end of street running at the four tracks. Not only that, but I doubt that a “Blimp” would fit in the Subway Terminal tunnel. Can anyone recall a fan trip where a Blimp ran in the Western District? It would probably run OK on the Santa Monica Air Line but I’ve never seen photos or heard stories about such an operation. When I was 9 years old my Grandmother took my brother and I on a ride the last day of operation for the old PE cars to Long Beach. I’ll always remember the “Shredded Wheat” seats on the red cars. Also how warm it was in the car.